The UN and Red Cross have appealed for civilians to be protected, as fighting in Syria's Aleppo nears its end. The International Committee of the Red Cross (ICRC) said people had "literally nowhere safe to run". UN Secretary General Ban Ki-moon voiced alarm "over reports of atrocities against a large number of civilians". Thousands of people are trapped in just a handful of rebel-held districts, which are facing intense bombardment as government troops advance. What is the situation in rebel areas? 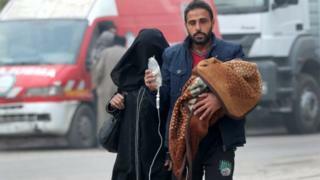 It is hard to know exactly how many people are trapped in the besieged areas, although one US official with knowledge of efforts to secure safe passage for people in the city told the BBC that there were around 50,000 people. Some residents have sent out messages saying they are crowded into abandoned apartments and rainy streets, unable to take shelter from the bombing, the New York Times reports. Teacher Abdul Kafi Alhamado described on Monday how his district was densely packed with people who had arrived from other areas, and "bombs are like rain", so there are "huge numbers of casualties". "People are running, they don't know where, just running. People are injured in the streets, no-one can go to help them. Some other people are under the rubble, no-one can help them," he told the BBC. 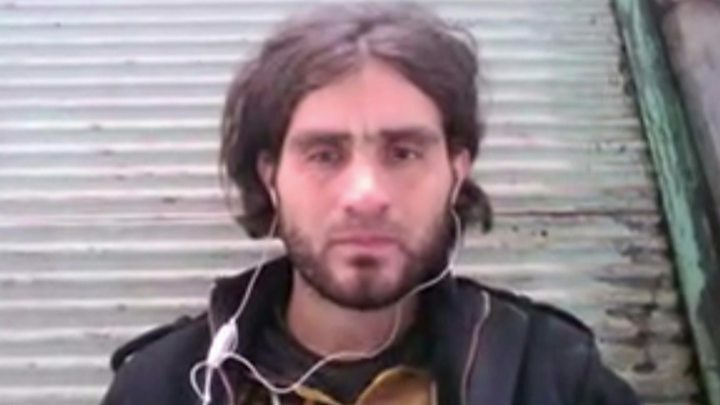 Many are said to be fearful about what will happen to them after the city falls, particularly after allegations by opposition activists that Syrian government forces have been carrying summary killings of rebels in neighbourhoods that were captured on Monday. These claims appear to be backed up by the UN's humanitarian adviser on Syria, Jan Egeland, who said they had received "detailed reports of massacres of unarmed civilians, of young men, of women, children, health workers". In western Aleppo, which is under government control, Syrian state TV showed footage of people celebrating at the prospect of an imminent victory. How much of Aleppo remains in rebel hands? Again, it is not entirely clear. Russia's military, allied to the Syrian government forces, says 98% of the city is now back in government hands. According to the AFP news agency, the rebels have control of just a handful of neighbourhoods, including Sukkari and Mashhad. The Syrian army's Lt Gen Zaid al-Saleh said on Monday that the battle "should end quickly", telling the rebels they "either have to surrender or die". 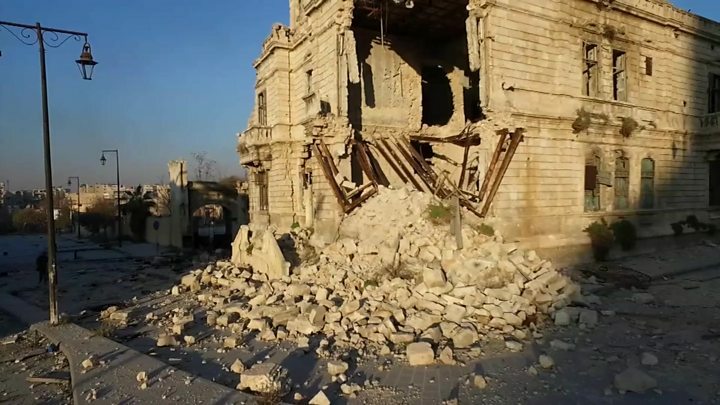 The British-based monitoring group, the Syrian Observatory of Human Rights (SOHR), has also said the battle for Aleppo "had reached its end", with "just a matter of a small period of time" before "it's a total collapse". What has been the reaction? Ban Ki-moon's spokesman, Stephane Dujarric, said "the secretary-general is alarmed over reports of atrocities against a large number of civilians, including women and children, in recent hours in Aleppo". "While stressing that the United Nations is not able to independently verify these reports," he said, the secretary-general had "instructed his special envoy for Syria to follow up urgently with the parties concerned". Meanwhile, the ICRC said a deepening humanitarian crisis could only be averted if basic rules of war and humanity were respected, warning "this may be the last chance to save lives". Mr Egeland tweeted that the governments of Syria and Russia were "accountable for any and all atrocities that the victorious militias in Aleppo are now committing". What do Syria and Russia say? The Kremlin has hit back at Mr Egeland's allegations, saying the atrocities "are actually being committed by terrorist groups", by which it means the rebels. "The fact here is he doesn't talk about these atrocities, which shows that unfortunately he doesn't have any information about the reality of the situation in Syria and Aleppo," said President Vladimir Putin's spokesman, Dmitry Peskov. The US said on Monday that Russia had rejected the idea of a pause in the bombing to allow people to leave. The Russian Centre for Reconciliation of the Opposing Sides says it has helped 7,796 civilians leave rebel-held areas in the past 24 hours. For much of the past four years, the city has been divided roughly in two, with the government controlling the western half and rebels the east. Syrian troops finally broke the deadlock with the help of Iranian-backed militias and Russian air strikes, reinstating a siege on the east in early September and launching an all-out assault weeks later. The Syrian Observatory for Human Rights says that at least 415 civilians and 364 rebel fighters have been killed in rebel-held areas since 15 November and another 130 civilians have died in rebel rocket and mortar attacks on the government-controlled west. Analysts say the fall of Aleppo would be a big blow to the opposition, as it would leave the government in control of Syria's four largest cities. Details are emerging from the mammoth 448-page report into Russian interference in the 2016 election. What's new in the Mueller report?